^ "Somalia signs deal with militia – Africa". Al Jazeera English. March 16, 2010. Archived from the original on March 22, 2010. Retrieved July 9, 2011. ^ "Malawi to send peacekeepers to Somalia | ReliefWeb". Reliefweb.int. January 22, 2006. Archived from the original on May 6, 2009. Retrieved July 9, 2011. ^ "allAfrica.com: Somalia: Islamist Groups Merge to Fight Sheikh Sharif (Page 1 of 1)". Archived from the original on February 9, 2009. Retrieved February 5, 2009. ^ "Fighting erupts in northern Somalia as peace talks falter, says Islamic official". International Herald Tribune, Associated Press. November 6, 2006. Archived from the original on December 10, 2006. Retrieved January 5, 2007. ^ "Somali prime minister says government is surrounded". Associated Press. November 6, 2006. Archived from the original on February 26, 2008. Retrieved January 5, 2007. ^ a b Yare, Hassan (December 13, 2006). "Troops dig in as Somalia war fears grow". Relief Web, Reuters. Archived from the original on September 27, 2007. Retrieved January 5, 2007. ^ Mohamed, Guled (December 25, 2006). "Ethiopian jets strike Somali airports". Reuters. Archived from the original on January 17, 2008. Retrieved January 5, 2007. ^ "Somalia 'needs peace force soon'". BBC News. January 5, 2007. Archived from the original on January 7, 2007. Retrieved May 27, 2010. ^ Ignatius, David (May 13, 2007). "Ethiopia's Iraq". The Washington Post. Archived from the original on October 14, 2017. Retrieved May 27, 2010. ^ "Ethiopian army accomplished 75% of mission in Somalia – Zenawi". SudanTribune article. Archived from the original on January 2, 2007. Retrieved July 9, 2011. ^ Ignatius, David (May 13, 2007). "Ethiopia's Iraq". Washington Post. Archived from the original on October 14, 2017. Retrieved May 16, 2007. ^ "Ethiopian army accomplished 75% of mission in Somalia – Zenawi". Sudan Tribune. December 29, 2006. Archived from the original on January 2, 2007. Retrieved January 5, 2007. ^ "Ethiopian PM says Somalia's Islamists have suffered thousands of casualties". International Herald Tribune, Associated Press. December 26, 2006. Archived from the original on February 26, 2008. Retrieved January 5, 2007. ^ "'Thousands' desert Somalia forces". BBC News. December 12, 2008. Archived from the original on December 13, 2008. Retrieved May 27, 2010. ^ a b "ReliefWeb ť Document ť Nearly 9,500 Somalis die in insurgency-group". Reliefweb.int. September 16, 2008. Archived from the original on October 21, 2008. Retrieved July 9, 2011. ^ "President Yusuf made the failed and unpopular decision to call in troops from neighbouring Ethiopia". BBC News. December 30, 2008. Archived from the original on December 31, 2008. Retrieved July 9, 2011. ^ "Ethiopian prime minister says his country is at war with Islamists in Somalia". International Herald Tribune, Associated Press. December 24, 2006. Archived from the original on January 1, 2007. Retrieved January 5, 2007. ^ Abdinur, Mustafa Haji (December 23, 2006). "Somali Islamists give Ethiopia one-week deadline to withdraw troops". Agence France Presse. Archived from the original on December 31, 2006. Retrieved January 5, 2007. ^ Rice, Xan (January 3, 2007). "Ethiopian troops to leave Somalia 'within weeks'". The Guardian. London. Archived from the original on January 16, 2017. Retrieved May 27, 2010. ^ "Moderate Islamic group claims victory over rival hardline group". Mareeg.com. Archived from the original on September 3, 2012. Retrieved July 9, 2011. ^ "Ahlu Suna Wal Jamea supported by Ethiopian government". Ethioforum.org. Archived from the original on February 13, 2009. Retrieved July 9, 2011. ^ "Moderate Islamist picked as Somali president". Edition.cnn.com. January 31, 2009. Archived from the original on February 2, 2009. Retrieved July 9, 2011. ^ Sheikh, Abdi (February 7, 2009). "Rebels target new president". In.reuters.com. Archived from the original on April 14, 2009. Retrieved July 9, 2011. ^ Chick, Court; Albert Grandolini (September 2, 2003). "Somalia, 1980–1996". Central, eastern, and southern Africa database. onwar.com. Archived from the original on March 7, 2007. Retrieved January 5, 2007. ^ "Ethiopian-Somalian Border Clash 1982". Wars of the World. onwar.com. December 16, 2000. Archived from the original on September 30, 2007. Retrieved January 5, 2007. ^ "Somalia: Ethiopia Denies Troop Incursion Allegations". University of Pennsylvania – African Studies Center. April 12, 1999. Archived from the original on September 22, 2006. Retrieved January 15, 2007. ^ "Ethiopian Troops Enter Somalia to Resist Islamic Militia". PBS. July 20, 2006. Archived from the original on January 19, 2014. Retrieved January 5, 2007. ^ "Somalis vow holy war on Ethiopia". EthioBlog. Nazret.com. October 9, 2006. Archived from the original on November 30, 2006. ^ "Witnesses: 6 Ethiopian soldiers killed in ambush by Somalia's Islamic fighters". International Herald Tribune, Associated Press. November 19, 2006. Archived from the original on December 13, 2006. Retrieved January 6, 2007. ^ "'Heavy fighting' in Somali town". BBC. December 8, 2006. Archived from the original on January 1, 2007. Retrieved January 6, 2007. ^ "Fresh fighting erupts in Somalia". Al Jazeera. December 8, 2006. Archived from the original on January 6, 2007. Retrieved January 6, 2007. ^ "Ethiopian tanks roll in Somali battle's fourth day". Alertnet.org. Archived from the original on January 11, 2007. Retrieved July 9, 2011. ^ "Ethiopia admits Somalia offensive". BBC. December 24, 2006. Archived from the original on January 16, 2007. Retrieved January 17, 2007. ^ "Ethiopia leaves key Somali town". BBC. December 28, 2007. Archived from the original on December 31, 2007. Retrieved December 28, 2007. ^ "Somali town overrun by Islamists". BBC News. February 25, 2008. Archived from the original on February 29, 2008. Retrieved May 27, 2010. 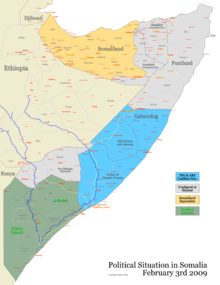 ^ "allAfrica.com: Somalia: Somali Rebels Seize Two More Towns (Page 1 of 1)". Archived from the original on May 20, 2008. Retrieved June 11, 2008. ^ "allAfrica.com: Somalia: Islamist Rebels in Secret Deal With Kismayo Port Militia (Page 1 of 1)". Archived from the original on May 26, 2008. Retrieved June 11, 2008. ^ "allAfrica.com: Somalia: Islamic Court Opened Near Mogadishu (Page 1 of 1)". Archived from the original on October 4, 2012. Retrieved June 11, 2008. ^ "Air raid kills Somali militants". BBC News. May 1, 2008. Archived from the original on May 4, 2008. Retrieved May 27, 2010. ^ "Somali parliament to be doubled". BBC News. November 26, 2008. Archived from the original on December 8, 2008. Retrieved May 27, 2010. ^ "Somali gov't, opposition sign power-sharing deal – People's Daily Online". English.people.com.cn. November 26, 2008. Archived from the original on November 2, 2009. Retrieved July 9, 2011. ^ "DAILY NATION – Somali MPs accept terms". Nation.co.ke. Archived from the original on July 23, 2011. Retrieved July 9, 2011. ^ "Ethiopia to pullout Somalia after guarantying safe departure of AU troops – PM". SudanTribune article. Archived from the original on October 4, 2013. Retrieved July 9, 2011. ^ "Somalia: Counting the Cost After Ethiopia Withdraws". Allafrica.com. Archived from the original on October 7, 2012. Retrieved October 17, 2014. ^ "allAfrica.com: Somalia: Hawiye Elders Say Mediation Efforts Going Well (Page 1 of 1)". Archived from the original on October 7, 2012. Retrieved February 10, 2009. ^ "Somalia conflict kills more than 2,100 this year". International Herald Tribune. March 29, 2009. Archived from the original on September 14, 2008. Retrieved July 9, 2011. ^ "Bomb attack on Somali PM's house". BBC News. June 3, 2007. Archived from the original on August 17, 2007. Retrieved May 27, 2010. ^ "AU base in Mogadishu attacked". BBC News. February 22, 2009. Archived from the original on February 22, 2009. Retrieved February 22, 2009. ^ ""Somalia graduation ceremony blast kills 23," December 4, 2009". Cnn.com. December 4, 2009. Archived from the original on December 7, 2009. Retrieved July 9, 2011. ^ Osman, Ali (August 24, 2006). "Ethiopia: Zenawi's sea of lies". Sudan Tribune. Archived from the original on November 29, 2006. Retrieved January 4, 2007.